You’ve enjoyed watching recent genealogy television shows where celebrities or even everyday people make exciting discoveries about their family history. Now you are ready to research your own family history. 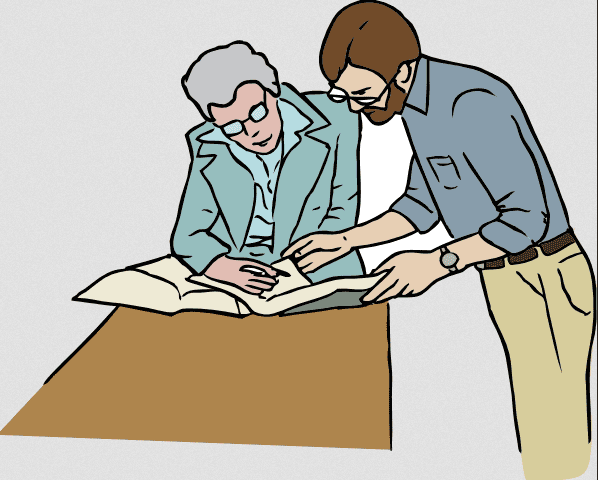 Maybe you’ve begun doing some family history research but need some guidance. Great! Family history is a wonderful pursuit and there’s nothing like the feeling of uncovering the stories of your family’s place in history. But you might be thinking: “Now what?” Well one of the first things you should do is to start with the here and now. There’s a funny saying that genealogy is about tracing yourself back to better people. Well that’s partly true; it’s all about tracing your family back in time, but in order to do that you need to start with you. I know, you’re thinking: “Why should I start with me? After all, genealogy is about family history, not about my life.” Yes, genealogy is about tracing and documenting your family’s history – but it’s also about connecting each generation of children to their parents. So start with yourself and document your relationship to your parents via a birth certificate or other record, then document your parents’ relationship to your grandparents – this allows you to start your research on the right track. It’s tempting to skip generations so that you can research a Revolutionary War veteran or the first immigrant ancestor, but resist that temptation because it can often lead to tracing the wrong ancestor. Start with what you know. When I started family history research I wrote down everything I knew. Now you may think you know absolutely nothing about your family, but try to jot down everything you know – from your own birth and marriage, to your parents, and so on. In my case, I knew my paternal grandparents, my maternal grandmother, and a paternal great-grandmother. I knew them personally so I wrote down those memories and asked for additional ones from my parents. In addition, I had a few items around my house that documented their lives. For example, my paternal grandmother’s elementary math text book showed she used the surname of a stepfather as a child. That gave me a clue as to what surname I should be looking for. I found a postcard addressed to my great-grandmother from Reader’s Digest that was used as a bookmark. That piece of mail provided a street address which then led to other records. I remembered that a distant cousin researched some of our shared family history and would send us a yearly Christmas letter packed with family history finds, so I started looking for those long-forgotten letters – and that led me to contacting her. 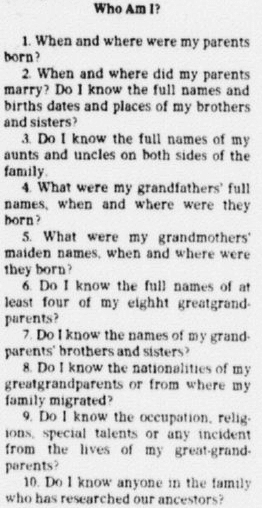 If you are having trouble coming up with what you know about your own family’s history, you might want to use this quiz from a 1977 newspaper column as a prompt. It has some great questions you can ask yourself to get a sense of what you know and what you’d like to discover about your family history. 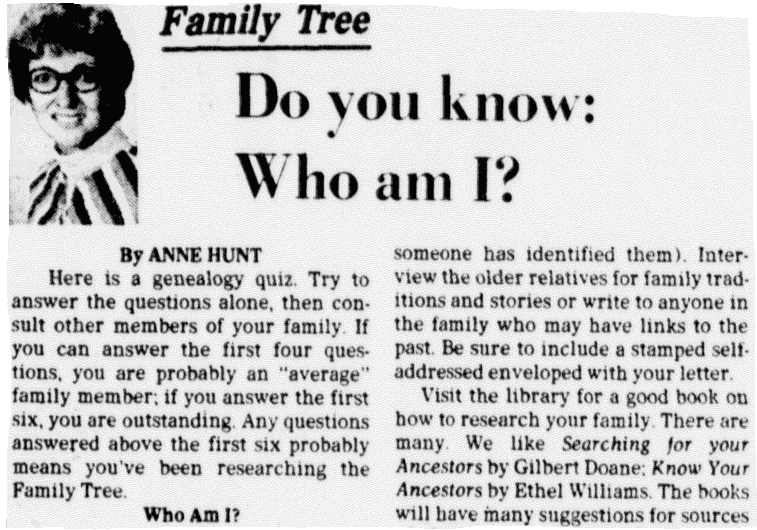 In her column that day, Anne Hunt provided these 10 genealogy questions. When and where were my parents born? When and where did my parents marry? Do I know the full names and birth dates and places of my brothers and sisters? Do I know the full names of my aunts and uncles on both sides of the family? What were my grandfathers’ full names, when and where were they born? What were my grandmothers’ maiden names, when and where were they born? Do I know the full names of at least four of my eight great-grandparents? Do I know the names of my grandparents’ brothers and sisters? Do I know the nationalities of my great-grandparents or from where my family migrated? Do I know the occupations, religions, special talents or any incident from the lives of my great-grandparents? Do I know anyone in the family who has researched our ancestors? Finding home sources is an important first step in starting your family history research. Many of us automatically answer a question about the availability of home sources with “I don’t have any.” But the more I looked around the house and started searching my memory, the more I was able to find. A home source doesn’t have to be a birth certificate or your ancestor’s passport. It could be as simple as a photo with a name on the back, a Christmas card, or a clipped newspaper obituary. What Does Your Family Know? Once I asked a distant cousin if she had anything about our mutual ancestor and she said no. But then she told me she had some old papers under the bed that I might find of use. Come to find out, one of those papers was written by a 5th great-grandfather and listed the names and birthdates of his children. People may believe initially they own nothing of genealogical value so don’t be surprised if it takes more than one conversation to learn all you need to. Take advantage of any upcoming holidays, or big events like a family reunion or a simple get-together, and start asking questions. Ask family members who was the oldest family member they knew. Solicit their memories of past family gatherings. Ask about heirlooms they treasure or that remind them of a story. Write down these reminiscences and add them to the information you are gathering. They can be clues to your current quest or future family history projects. Gathering what you know about your family is an ongoing process. As you research you will ask new questions about your ancestors – which will lead to more research that requires documentation and proof. Today’s request to know more about Grandma Smith might lead to questions about her mother, her childhood, or her marriage. Start right now. Write down what you know; don’t worry about researching just yet. No detail is too small. After that, look around your home and ask your family members to look around their homes for anything that tells the story of your ancestors, and ask them to share their memories with you. Those initial steps are vital in your family history quest. Look for upcoming articles in this Introductory Genealogy series on the GenealogyBank blog.